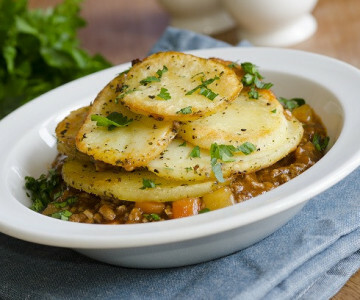 A perfect recipe for a hearty family meal, this Lamb hotpot would have given Coronation Street’s Betty a run for her money. Serve with seasonal veg and a nice glass of wine. 2) Heat an ovenproof casserole dish over a high heat. Add your bacon lardons and cook over a medium-high heat until they start to crisp up.Add the lamb to the pot along with the pepper and a drizzle of oil if needed. 4) Add the garlic and brown sugar. As the sugar dissolves it’ll create a sticky, golden glaze over everything. Creamline Top Tip: Serve the hotpot with seasonal vegetables and potatoes or with a wedge of warm bread and a glass of wine!